We are all searching for greater joy in our lives by actively pursuing personal growth, deep healing and expansion of our consciousness. What if greater joy were a choice and a course that you could steer yourself toward? Can we choose to vibrate to joy and gratitude? 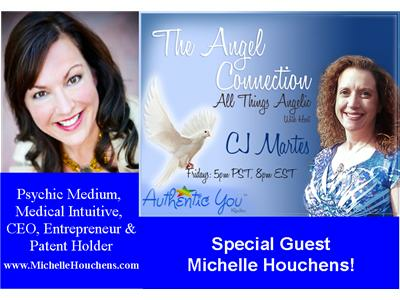 Join CJ as she explores how to Vibrate to Joy with her Special Guest Psychic Medium & Medical Intuitive Michelle Houchens. Michelle is a Psychic Medium, Medical Intuitive, CEO, and Patent Holder with over twenty five years of award winning success as a Sales and Business Development Executive in the Pharmaceutical and Medical Device industries. Her business expertise ranges from medical startups to hospital management and sales/marketing leadership with Fortune 100/300 healthcare firms, including Medtronic, Mennen Medical, and Ciba-Geigy Pharmaceuticals. Don't forget about the Angel Message of the Week and Inspiring News at the start of the show. The last segment of the show is reserved first come, first serve basis for Angel Readings with CJ. If you've got angel or other spiritual questions, this is a show you won't want to miss! Call toll-free during the show: 1-877-296-0345.